and beef bouillon. Set aside. Thinly slice the beef across the grain. Lightly salt and pepper the beef slices. Heat 1 teaspoon oil in a large nonstick skillet over medium heat until rippling and hot. Add the beef in a single layer. Remove the beef to a plate or bowl. Add the remaining 1 teaspoon oil to the pan. Add the green onions and garlic. Cook for one minute, stirring constantly, until fragrant. Add the chopped broccoli carrots and red pepper. Add the water, cover the skillet, and cook until the vegetables are crisp-tender, 2-4 minutes. Stir in the cooked beef. Whisk the sauce to recombine and stir it into the skillet. and the sauce has thickened, 2-3 minutes. Serve over hot, cooked rice. Enjoy this amazing recipe and many more when visiting melskitchencafe. Very adorable dish! I will recommend this to my wife to use this recipe for our dinner later. 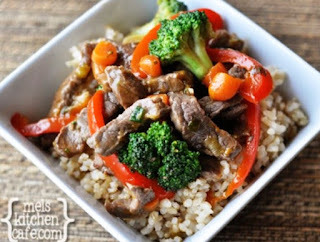 Anyway, Are you looking for more recipes for stir fry? Check it Here.